Dog-friendly cabin with a spacious deck and outdoor seating! 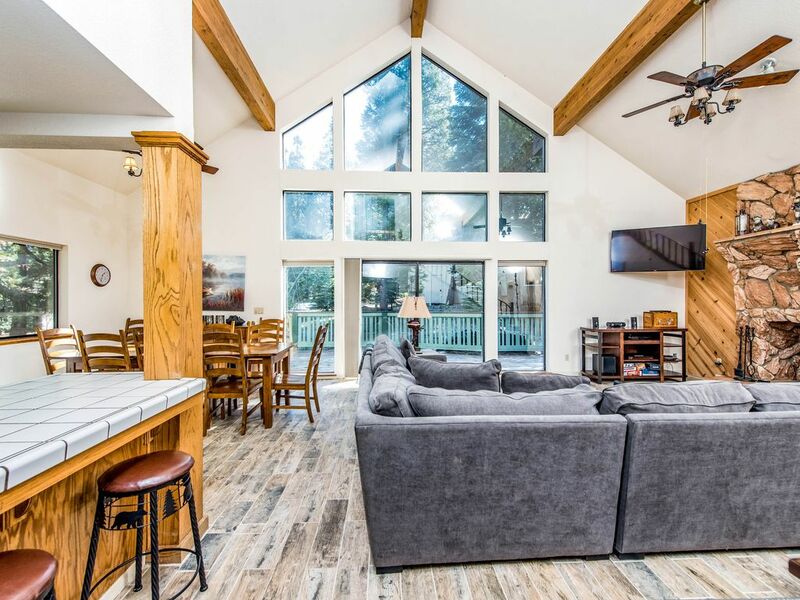 Escape to this family-friendly cabin near Shaver Lake and reconnect with the mountains! Up to 10 are welcome at this cozy home, where a spacious deck offers guests a chance to breathe in the pine scent and simply relax. The family dog is also welcome to join you for an additional nightly fee. Fishermen and women flock to Shaver Lake for its abundance of Rainbow Trout and other specimens - start your angling adventure at the marina a little over four miles away. In winter, China Mountain's ski slopes are within about 21 miles of this cabin, an easy day trip. Young visitors might be especially pleased with the bunk bed accommodations. The chef of the group can take ownership of the full kitchen here, complete with an oven, fridge, stove, and microwave. Four TVs and free WiFi ensure everybody stays connected during your trip to the mountains. A private washer and dryer make post-ski laundry less daunting. Book this lovely Shaver Lake cabin for your family's next mountain excursion! * Please be aware that all guests must be at least 25 years of age unless accompanied by parent or legal guardian. *All same day bookings must be made through the local office between the hours of 8:30am-5:00pm PST. For same day bookings, please contact Vacasa. Parking Notes: 2 vehicles may park in the garage and 2 vehicles may fit in the driveway. No parking on the street during winter months due to snow removal. No recreational vehicles or camping allowed in yards and driveways. Boat & Trailer Parking: Allowed only in West Village & East Village. We recommend to all guests to utilize Sierra Marina for a wet slip and/or trailer parking. Our 2nd time booking this rental and loved it! Very roomy and perfect location for playing. We are a family from Southern California who came to ski at China Peak for a couple days. We found the cabin very comfortable, well stocked, and overall had an excellent stay here. The neighborhood and surrounding area is beautiful. Shaver lake town is a few minutes drive away and China Peak is a 20-30 min drive away. Had a nice ski vacation at a fraction of the cost as other areas. Highly recommend. Our stay was lovely! The cabin was clean and well taken care of! We can’t wait for our next stay at Paw’s cabin!